We are constantly astonished how consistently investors make wrong bets on the markets, investing near tops and selling near bottoms. That’s because they are driven by irrational emotions of fear and greed, instead of reality. And that’s why we use investor sentiment gauges as contrarian indicators of where the market is headed. Back in late December investors were registering extreme caution and fear because of the previous big declines. So they missed the subsequent bounce. Now with recent upward market moves, fear and greed is moving toward overly bullish territory, despite increased volatility and economic warning signs. That’s why we again caution that smart investor should take recent gains by reducing exposure. 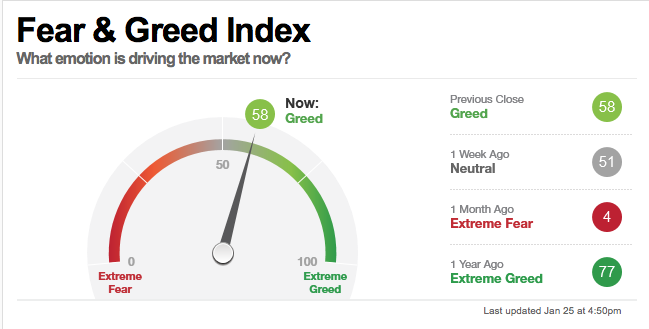 During the past week the CNN Fear/Greed indicator, which was registering extreme fear and greed in the single digits in late December, moved to overly bullish territory at 59 from a neutral 43 the week before. The Ned Davis Research short-term sentiment, in the mid-40s, was in neutral territory. Intermediate term indicators moved higher. The Investors Intelligence poll of more than 100 newsletter writers came in at 46% bulls and 21% bears, moving higher into resistance territory from the previous week. The NDR crowd sentiment moved up to the low 50’s, which is neutral. The market has had a very large bounce from the oversold level at the end of last year. And investor sentiment is increasingly complacent, ignoring all the signs of how volatile and potentially dangerous the market has become. The market is most likely to shift around indecisively for a time, frustrating everyone. However I am expecting another large move down in the markets later in the year, or even sooner.